The rounded back saves kitchen space, it performs well and looks smart. The colour scheme may not appeal to all - however if you are looking for a magenta microwave, then this will fit the bill. 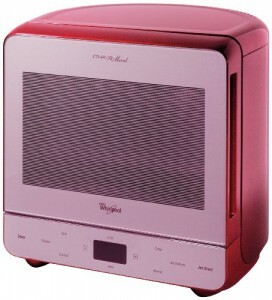 There aren't many magenta microwaves on the market - this is the only one we're aware of. It's been released as part of Whirlpool's Max 38 Crisp range - a selection of microwave ovens with a curved back panel, which enables them to be placed into the corner of a kitchen, which helps save space over a similar sized rectangular microwave. This particular model offers 13 litres of capacity, which doesn't sound like much - however it still features a full size 28cm turntable, so the vast majority of plates will fit easily into the microwave. Overall microwave power output is 750w - it also features a grill mode which during our test left food with an even crisp and brown finish. Five different power levels are included, which are easy to set using the controls. In order to save space, Whirlpool have placed the controls at the base of the door - this helps the microwave to remain slim, and thus take up less kitchen surface. The display features a LED 24 hour clock, and is easy to read even in a brightly lit kitchen. We liked the overall performance of this microwave - build quality is good, and it's easy to both use and clean. It will be the ideal appliance for those looking for a magenta or pink microwave. A smart looking microwave, finished in a unique magenta colour scheme. If you're after a quirky grill microwave, this is not a bad choice.